How to construct a Hexagon given only one side to start with. The main principle we are going to use to complete this question is that a hexagon is made up of 6 equilateral triangles. Keeping that in mind we take the radius AB (the line we started with) and swing it from point A and from point B. 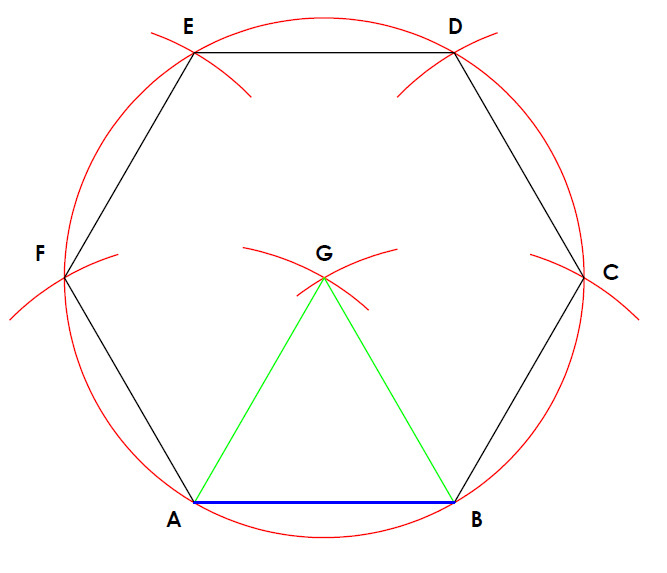 Where the two arcs intersect will give us point G (the centre of the hexagon). Triangle AGB is an equilateral triangle since all sides are equal. Next we keep radius AB and swing a circle from point G. This circle is the circle we want to enclose our hexagon within. Now we swing radius AB from point A, to cut the circle, giving us point F. Move to point F and swing the same radius to create point E and so on until you have 6 points on the circle. Finally join up the 6 points to create a hexagon.